Portugal's Algarve circuit is the latest venue to show an interest in occupying the vacant European race slot on the F1 calendar. The last official calendar to be published by the FIA left a date open on July 21, with Turkey and France initially in the frame to fill it. According to Bernie Ecclestone France is still in the running but he has also mentioned the Algarve as a potential venue, although he still doubts a full calendar of 20 races would happen this year. "To be honest, I don't know," Ecclestone was quoted by Autosport. "There is interest still in France, and now also in Portugal. 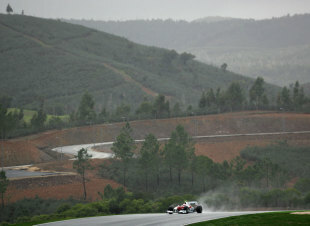 They want to do it at the new Algarve track." The Algarve circuit, near Portimao, held two F1 tests in 2008 and 2009 and features an undulating track that has played host to GP2, World Series by Renault and FIA GTs in the past. The circuit is a favourite among drivers and fans, and speaking recently about his experiences testing at the circuit in the wet in 2009, Kamui Kobayashi joked: "In the wet when you're going downhill you have wheelspin ... really. Every lap I nearly cried." But Ecclestone warned that the teams are not overly keen to have a 20th race this year. "If someone wants to have the 20th race, it will happen, if the track is there and okay. We can help organising. However, the teams do not seem to be in favour of this race. I doubt it will happen."